by Jonathan McGoran | photo by Albert YeeOne of the questions you hear a lot when you work at a food co-op is, “What the heck is a food co-op?” It’s kind of a tricky question. On the one hand, there’s a simple answer: It’s a food store owned by its members for their mutual benefit. Factually correct, but incomplete. On the other hand are all the “What my co-op means to me” answers, a gazillion variations, each one different. People feel quite strongly about what their co-op means to them. (Not strong enough to fight obviously—this is a co-op. But there have been rolled eyes and the occasional condescending shake of the head). Local, natural, organic, fair trade and sustainable are all important aspects of a food co-op, and each is most important to someone. But one thing that is essential to just about everybody is community. I started working at Weaver’s Way Co-op when it was ten years old and I was nineteen. People weren’t as aware of food issues back then. Imported had more caché than locally grown, organic was relatively unknown and natural wasn’t even a cynical marketing ploy. Most of what I now know about the politics and economics of food I learned while working at Weaver’s Way, and most of what I know about community I learned there as well. The community I initially felt came from the people I saw everyday—my coworkers and the shoppers. But, over the years, I’ve seen the long-term impact a co-op can have on a community, both within the co-op and throughout the surrounding area. I’ve seen touching reunions between shoppers in the produce aisles (actually, I’ve been stuck behind them while trying to grab a head of lettuce). I’ve seen lasting friendships formed over the course of a two-hour work slot between people with almost nothing in common other than their co-op. (Members are no longer required to work at Weaver’s Way, but most still do.) Of course, I’ve also seen volunteers come to a fast, intense mutual dislike—that second hour can be hilarious to witness, deepening the bond among those watching and laughing. As Weaver’s Way has expanded, I’ve witnessed connections made at the Co-op’s monthly recycling event, farm programs and educational events. The store’s gravitational pull has grown as well. The intersection of Greene Street and Carpenter Lane has seen an amazing resurgence. 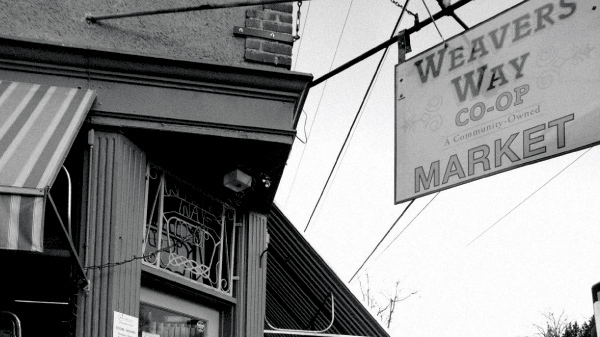 Big Blue Marble Books, Highpoint Café, Maternal Wellness Center and Philly Electric Wheels are all dynamic, independent businesses that probably wouldn’t be there without Weaver’s Way. Co-ops also support other co-ops; it’s one of the principles that define us. Part of why Weaver’s Way has worked so closely with Creekside Co-op is that, having seen the strengthening of community Weaver’s Way brings to Northwest Philadelphia, we want to see Creekside bring the same to Elkins Park, and other new co-ops bring it to Kensington, South Philadelphia, Lehigh Valley and Doylestown.